It had been a day where everything had to go just right – with no room for error to accomplish an impressive list of achievements in just over ten minutes time. SpaceX achieved a new milestone in space flight history Monday night when the company’s Falcon 9 booster successfully guided its first stage to a safe onshore landing, returning from the edge of space in a high-speed orbital delivery of 11 Orbcomm second generation satellites. Launching a rocket is already an ambitious undertaking, but fabricating a sequence of events to return a booster stage after dispatching a payload on its way to orbit has been unprecedented and required years of work by thousands of SpaceX employees, at the forefront the company’s CEO and Chief Designer Elon Musk who expressed ambitions to make access to space affordable through reusability years back when starting out on the Falcon 1 rocket. Initially experimenting with parachutes deployed from first stage boosters for a gentle splashdown in the ocean, SpaceX quickly turned to the much more complex technique of returning rockets under the power of their own engines – enabling them to return to the launch site for rapid refurbishment and re-use, a vision that started taking shape with the inauguration of a gradual series of improvements of the company’s Falcon 9 rocket – giving it the ability to re-start its engines, maneuver around in the rarefied upper atmosphere, guide its way back to a landing site by tilting and rotating four grid fins and coming to rest on four deployable landing legs, ideally without tipping over. To make Monday night’s launch a success, Falcon 9 had to go through a modified countdown procedure that in and of itself already presented a significant challenge as over 500 metric tons of sub-cooled Liquid Oxygen and chilled Rocket Propellant 1 had to be pumped into the two-stage rocket in a period of just 32 minutes – no small feat as shown in the Static Fire Test completed last week which needed three attempts to get the tanking sequence tuned right in order to have both stages at flight mass at the correct T-0 time, not a trivial task when working with sub-cooled propellants. Heading into a lengthy countdown on Monday, Falcon 9 was powered up 12 hours prior to the opening of the day’s five-minute window to undergo detailed testing while teams cleared the launch complex to get set for propellant loading. Given the compressed timeline with fueling only in the last hour of the count, all tests were completed well beforehand and awarded the 70-meter tall rocket a clean bill of health. Polling of the launch team at T-38 minutes revealed everything was in readiness to load the vehicle with propellants. No issues occurred at any point and the countdown entered its Automated Sequence, all while the tanks were still in the process of being filled, a task most rockets finish with minutes or even hours to spare, but not Falcon 9. Liquid Oxygen loading reached flight level just around three minutes ahead of launch, in time for the pressurization of the tanks to allow the large Strongback structure to retract and clear the way for the rocket. Getting close to ignition, Falcon 9 finished the chilldown of its nine engines and assumed control of the countdown for the final pressurization of tanks ahead of the commands to ignite the engines, issued at T-3 seconds. 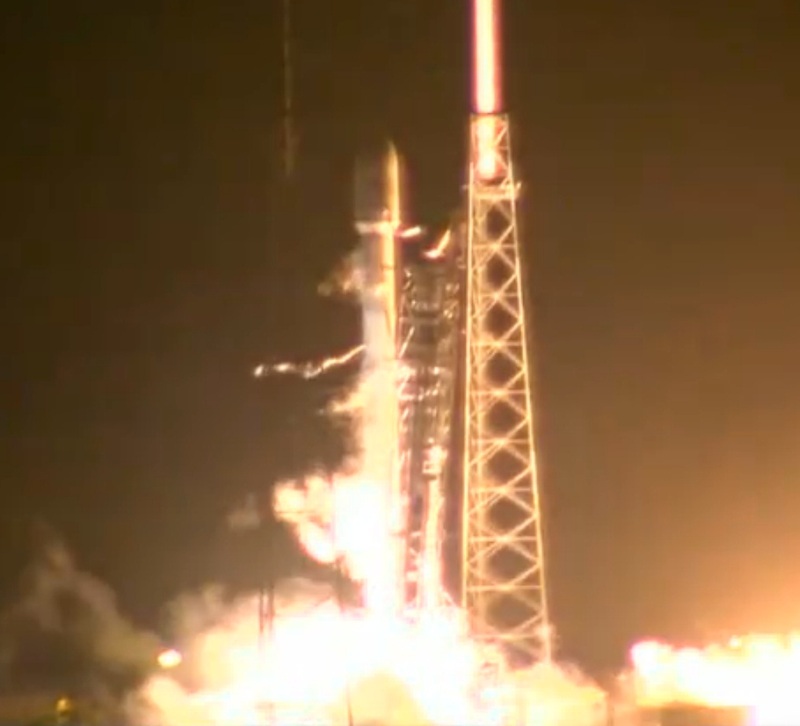 The characteristic green flame of the igniter fluid erupted from the base of the rocket as Falcon 9 came to life again after a stand-down of nearly half a year. 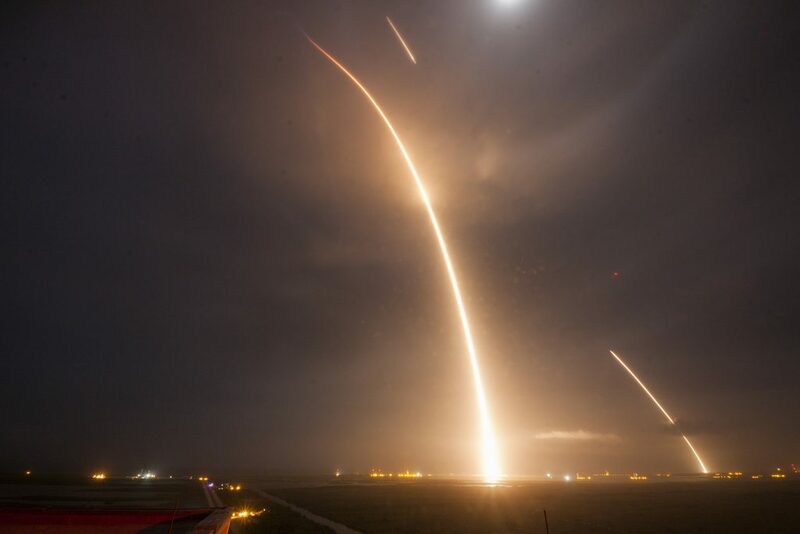 All nine Merlin Engines reached operational conditions, allowing Falcon 9 to soar into the night skies over Florida’s Space Coast at 1:29 UTC on Tuesday, 8:29p.m. local time on Monday. Falcon 9 cleared the towers and began its pitch and roll maneuvers to begin heading to the north-east to deliver the 11 OG2 satellites tucked away inside the large payload fairing to a 47° orbit. The vehicle performed flawlessly as it headed through Mach 1 around 70 seconds into the flight with Maximum Dynamic Pressure following another 15 seconds later. The adventurous landing of the first stage was assisted by the fact that this mission flew a slightly lofted trajectory, a luxury arising from the low mass of the Orbcomm satellites, each weighing in at just 172 Kilograms. Passing T+2 minutes, the second stage’s MVac engine was chilling in for its critical burn while its counterparts on the first stage throttled back in preparation for shutdown that occurred just after T+2 minutes and 20 seconds when the stage was 72 Kilometers in altitude, traveling at Mach 4.85. Separation of the stage was completed two seconds after MECO, making use of a fourth pusher system, added to the separation mechanism to ensure the first stage could clear the larger engine bell of the new Mvac engine. With the first stage free again, the second stage continued the primary mission, lighting its 95,300 Kilogram-force MVac engine for a burn of around seven and a half minutes to accelerate the stack by another six Kilometers per second to reach orbital velocity. 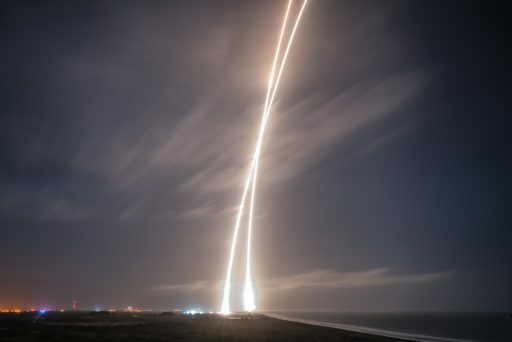 Although the burn of the second stage and the delivery of the eleven OG2 satellites was the primary mission of Falcon 9, all eyes were on the first stage as it began its journey to Landing Zone 1, nine Kilometers south of Space Launch Complex 40 where a large flat pad was established on the grounds of the former Space Launch Complex 13 that supported Atlas rocket launches in the early days of space travel in the 50s, 60s and 70s. First for the booster was a maneuver to flip around, using the small Nitrogen Cold Gas Thrusters on its forward and aft section to complete the pitch-over, pointing its engines towards the direction of travel. Next was the often overlooked propellant settling maneuver, a criticality in ensuring a clean re-start of the engines, accomplished by using the nitrogen thrusters to provide a small acceleration that settles the propellants in the back of the tanks so that the engines do not ingest any gas bubbles at ignition. Boost-back burn start-up was called out on the voice loops and met with ecstatic cheering at SpaceX’s headquarters in Hawthorne, California where employees not directly involved in the execution of the mission had gathered. 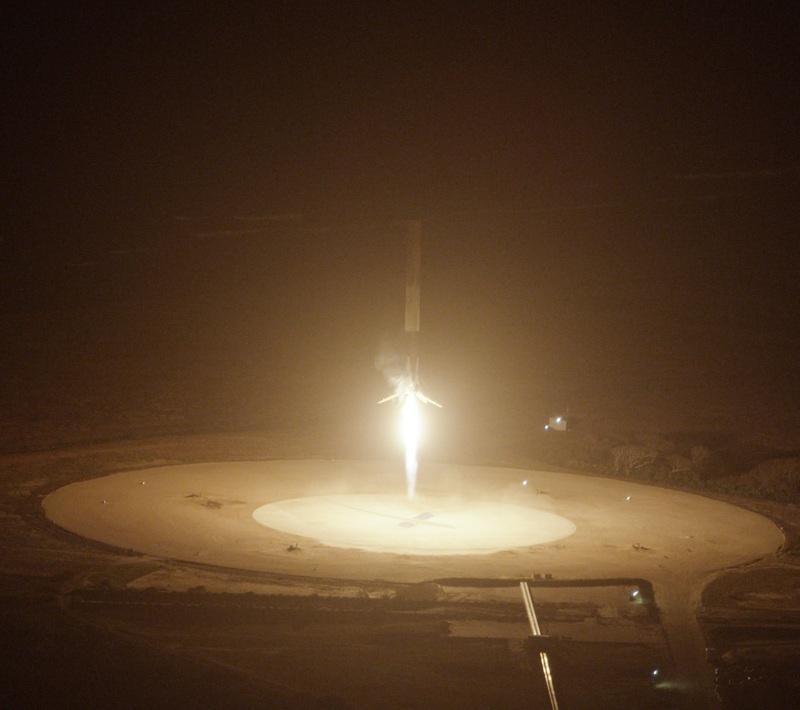 The burn was Falcon’s first 100% boost back, reversing the rocket’s direction of travel and providing it with enough energy to make it back to the Cape after reaching a peak altitude of 200 Kilometers. Inbound for re-entry, the stage deployed its four grid-fins, each of which can be controlled along two degrees of freedom to be able to provide three-axis control once in the discernible atmosphere. The fins are an essential part in achieving the accuracy needed to guide the booster back to a landing site as the engines can not deliver the amount of maneuvering during their short periods of operation. Re-start of a subset of Falcon’s engines occurred when about 70 Kilometers in altitude as part of a 20-second re-entry burn to a) slow the booster down for descent and b) shield the engine compartment from aerodynamic forces occurring at re-entry. After the conclusion of the burn, the stage was in atmospheric flight for 50 seconds – in this phase of the return, the hydraulic grid were employed to modify the booster’s angle of attack to control the downrange travel distance and to correct any cross-track errors to place the stage close to its intended landing burn target. 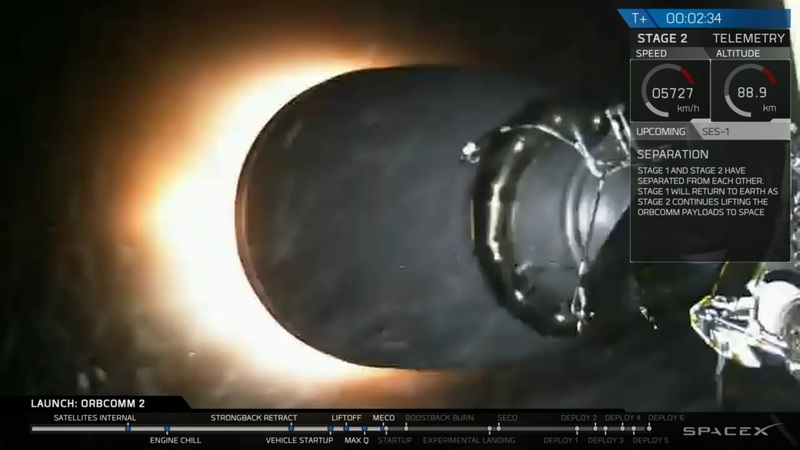 The returning booster announced its arrival with a powerful sonic boom heard around Cape Canaveral right before the Merlin 1D engine in the center of the Octaweb engine arrangement commenced the final landing burn. 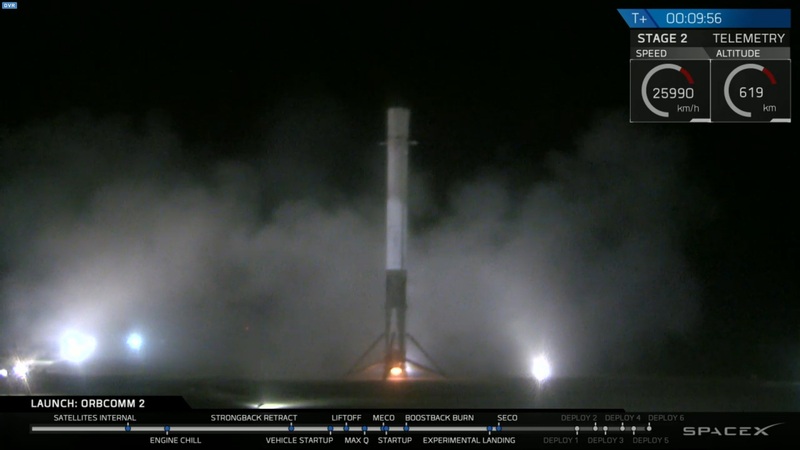 The landing burn started around 33 seconds prior to touchdown as Falcon 9 lit up its center engine that was then tasked with some heavy-throttling to slow the stage down to a gentle speed under ten Kilometers per hour for a hoverslam landing. 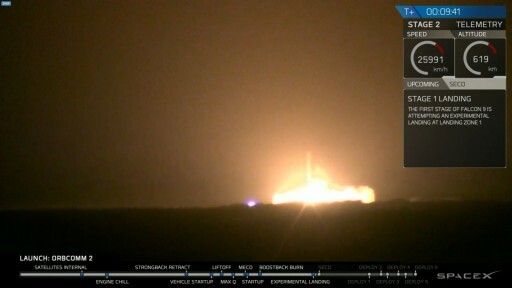 Live video from the landing site showed the booster descending in a blaze of fire before rapidly decelerating and maintaining a vertical posture for touchdown on all four legs, finally sticking the landing after coming close twice when attempting to land on the Autonomous Spaceport Drone Ship that was sidelined for this first onshore landing. Engine shutdown was called on the Launch Net and a subset of engineers were ordered to conduct safing of the returned rocket stage, a first for orbital space travel. 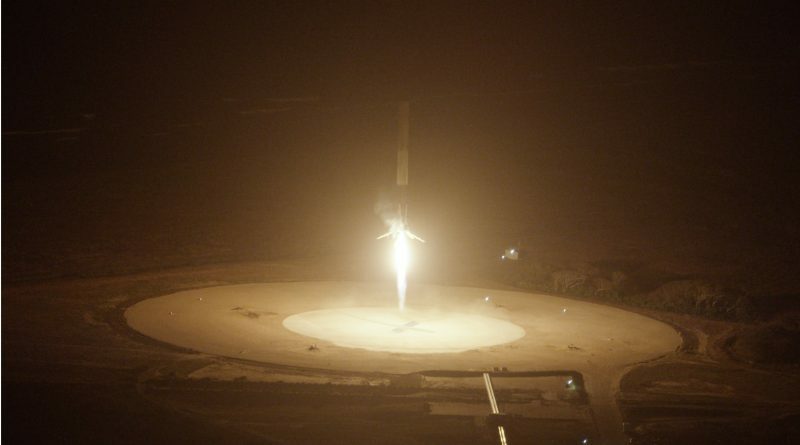 Touchdown occurred around nine minutes and 44 seconds after liftoff and cheers at SpaceX reached their peak as years of work finally came to fruition. The only very minor flaw in Falcon’s landing adventure seemed to be a persistent fire on one of the outboard engines, possibly due to leaking Kerosene fuel or hydraulic fluid. While everyone not involved in the mission started celebrating, the team at the Launch Control Center had to keep their focus and watch over the second stage that made a clean shutdown at T+9 minutes and 26 seconds, reaching its target orbit for the separation of the 11 OG2 satellites. The satellites were separated in pairs, starting at T+15 minutes and setting the small spacecraft up for the deployment of their solar arrays and communications antennas. All 11 successfully checked in with ground stations, marking the successful completion of Falcon’s primary mission. In another secondary objective, the MVac engine on the second stage was to ignite again on a 0.4km/s deorbit maneuver to demonstrate that the modified engine could be re-ignited in flight which was not needed for Monday’s mission but will be a critical requirements for Falcon 9’s bread and butter business – the launch of Geostationary Communications Satellites. 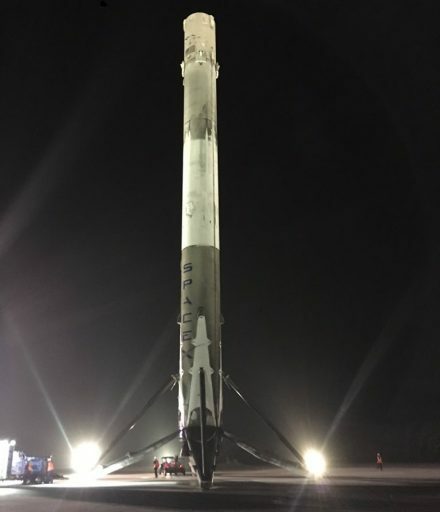 Having achieved a great success, SpaceX will work with the returned booster to scrutinize the condition of every component to gain an understanding of what will be necessary to reach an operational re-usability of Falcon 9 first stages. Obviously, SpaceX has high hopes to add more returned boosters to their collection in the not-too distant future with three launches lined up for the first weeks of 2016 – the launch of the Jason-3 weather satellite from Vandenberg on January 17 marking the final flight of Falcon 9 v1.1, the first Geostationary Transfer Orbit mission of the enhanced Falcon 9 with the SES 9 satellite, and the return of the Dragon spacecraft to the International Space Station.